My wife and I are planning to travel to Japan next September (we are from Brazil). Since I was a child I have known that if I made a hole (a big one) straight down, I would reach Japan. Well, as the time passes every time I look at the ground, I imagine that far, far away there it is, Japan. Now that I'm going to Japan, I would like to know for curiosity (and to perhaps reach this place in my travels), the exact point in Japan that represents the place that, if I could dig a very big hole directly down from my house in Brazil, I would find in Japan. So, is there some tool online that could help me? Is there some way to easily find this place using my home coordinates? It's very easy, and a quick google search for 'antipode' and 'map' will find sites that find it for you. For example, Antipodes Map either detects your location, or you can enter one, and it'll show you on a zoom-able map where your antipodal destination is. Unfortunately as shown by the map above, only about 15% of land territory is antipodal to other land, and only a tiny fraction of Brazil is antipodal to Japan (in fact, to the islands of Okinawa and Amami). A rather larger amount of Brazil (but still a small fraction of the country as a whole) is antipodal to the Philippines and Indonesia, along with Brunei, parts of Malaysia and the South Korean island of Jeju. Without knowing your exact location I can't be sure where it ends up. I'll leave that last step up to you to investigate! Another "Map Tunneler" site shows it quite nicely side by side. I can click and zoom in on New Zealand and the other window zooms in at the same time to show me northern Spain - the antipode. Yes the lat/lon coordinates are your friend. Lets assume the following coordinates are yours: S 9° 17' 42", W 51° 19' 17". You are 9 degrees south of the equator. Your antipode will be 9 degrees to the North. Just replace the S by the N and you have the latitude of your antipode (N 9° 17' 42''). It appears that the antipode of the center of Brazil is close to the Philippines. Use the Map Tunneling Tool. Unfortunately you won't reach any islands in Japan unless you live close to the Uruguay border. Find a globe. Put your arms out front with the forefingers pointing in. You are now a human calliper. Bring the arms together to nip the globe such that the left finger touches home. The right finger is now on the target. Rotating the globe might help, unless you're a gymnast. Wolfram Alpha could help here as well. 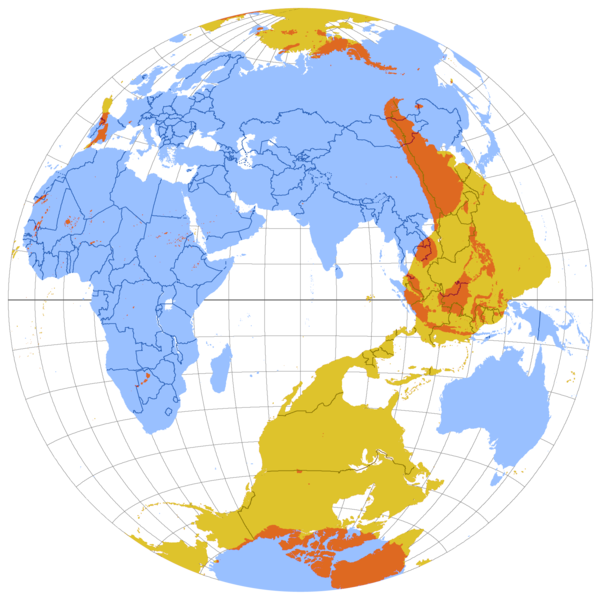 For example, typing in antipode of London, UK shows a map with a point south of New Zealand. The Google Earth application makes this really easy, no searching or math required. Just choose tools->ruler. Zoom in on your home and click to begin measuring. Zoom out and rotate the globe until the ruler starts spinning around the globe in circles. Zoom in on that spot and keep moving the ruler until you're as close as you want to get, then note the coordinates. Not the answer you're looking for? Browse other questions tagged factoids where-on-earth geography or ask your own question. How can I travel to the Great Pacific garbage patch?